For another person with the same nickname, see Juanfran. This name uses Spanish naming customs: the first or paternal family name is Torres and the second or maternal family name is Belén. Juan Francisco Torres Belén (Spanish pronunciation: [ˈxwamfɾan ˈtorez βeˈlen]; born 9 January 1985), known as Juanfran, is a Spanish professional footballer who plays for Atlético Madrid as a right back. After starting out at Real Madrid, he went on to make a name for himself in La Liga with Osasuna and Atlético Madrid, signing for the latter in 2011 and going on to win five major titles, including the 2014 national championship. A Spanish international since 2012, Juanfran was part of the squad that won that year's European Championship, and also represented the nation at the 2014 World Cup and Euro 2016. Born in Crevillent, Alicante, Valencian Community, Juanfran was a product of Real Madrid's youth academy. He had his first main squad opportunity on 24 January 2004, playing 15 minutes in a 2–1 home win against Villarreal CF after solid performances with the B-team. Over the course of that and the following seasons, he would play on a further five La Liga matches. Juanfran was loaned out to RCD Espanyol for 2005–06 and, although the Catalan side barely avoided relegation, he featured heavily throughout the campaign, scoring on 22 March 2006 in a 1–1 draw at Athletic Bilbao. He started his career as a winger. Juanfran signed with CA Osasuna after a deal that allowed Osasuna to get the player without having to pay a transfer fee and with per-set price of €10 million, adding several specifics, which included a possibility of a January 2007 recall by Madrid, which also retained a buying option at the end of the season. He played his first game for the Navarrese on 24 September 2006 in a 2–0 win at Celta de Vigo, and scored the second goal of the match; additionally, he appeared in nine games scoring once, in the club's semifinal run in the UEFA Cup. In 2008–09, Juanfran was again an everpresent fixture in Osasuna's lineups. On 31 May 2009, in the season's closer, he scored from 30 yards in a 2–1 home win over former side Real Madrid, which kept the club in the top flight for another year; in the following campaign, as Osasuna fared better in the league by finishing 12th, he scored a career-best four goals. On 11 January 2011 Juanfran signed for Atlético Madrid until June 2015, for a fee of just over €4 million. He made his official debut for the Colchoneros two days later, starting in a 1–3 away loss against his first professional team Real Madrid, for the season's Copa del Rey. Juanfran scored his first goal for Atlético on 21 May 2011, in a 4–3 win at RCD Mallorca – the last game of the campaign – dedicating it to his father who had died two weeks beforehand. In 2011–12 he begun being regularly played as a right back, by both Gregorio Manzano and his successor, Diego Simeone. In the season's Europa League final, which the club won 3–0 against Bilbao, he played in that position; after the match, he dedicated the triumph to his late father, saying (according to UEFA.com) "My baby son Oliver is here with me; the only words he knows are 'mama' and 'Atleti',I dedicate this win to my family and to my dad, who passed away last year. I know he's up there looking down on us celebrating now." On 24 May 2014 Juanfran played all 120 minutes of the Champions League Final, which Atlético lost 1–4 to Real Madrid at the Estádio da Luz. One month later he signed a contract extension, running until 2018. 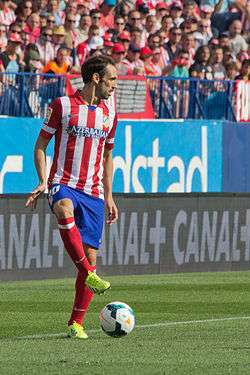 Juanfran started both legs of the round-of-16 Champions League tie against PSV Eindhoven. On 15 March 2016, in the second match, he took the decisive penalty in the 8–7 shootout win (0–0 on aggregate); in the final of the competition, also decided on penalties after a 1–1 draw in Milan, he was the only player to fail to convert in an eventual defeat to his former club Real Madrid. Juanfran had an extraordinary performance at the 2004 UEFA European Under-19 Championship, as Spain won and the player received the Golden Player award. In a rare achievement he took part in two FIFA World Youth Championships, the first in the United Arab Emirates where the national team took the silver medal; in the 2005 edition Spain reached the quarterfinals, eventually ousted by winners Argentina. Juanfran made his full side debut on 26 May 2012, playing the entire match in a 2–0 friendly win with Serbia in St. Gallen, as a right-back. He was selected by manager Vicente del Bosque for his UEFA Euro 2012 squad, being an unused player as Spain won the tournament in Poland and Ukraine. Juanfran scored his first international goal on 16 November 2013, playing the entire 2–1 friendly win in Equatorial Guinea. However, this match was ruled invalid by FIFA as they had not been notified early enough that the referee would be from Equatorial Guinea. Juanfran was named in Spain's 30-man provisional squad for the 2014 FIFA World Cup, and was also included in the final list. With the country already eliminated, he made his tournament debut in the last group game against Australia, playing the whole 90 minutes and assisting David Villa for the first goal of a 3–0 win. Juanfran married Verónica Sierras, with whom he had two children, Óliver and Alexia. ↑ "A zarpazos" [Clawing it] (in Spanish). Mundo Deportivo. 25 January 2004. Retrieved 13 March 2014. ↑ "Yeste llega al rescate" [Yeste comes to the rescue] (in Spanish). Mundo Deportivo. 23 March 2006. Retrieved 13 March 2014. ↑ "Juanfran firma con el CA Osasuna para las próximas cuatro temporadas" [Juanfran signs with Osasuna for the next four seasons] (in Spanish). CA Osasuna. 29 August 2006. ↑ "Manzano prueba a Juanfran como lateral derecho" [Manzano tests Juanfran as right back] (in Spanish). Diario AS. 6 October 2011. Retrieved 23 March 2012. ↑ "El Atlético reinventa a Juanfran" [Atlético reinvents Juanfran] (in Spanish). ABC. 12 March 2012. Retrieved 23 March 2012. ↑ "Emotional Juanfran dedicates Atletico Madrid's Europa League triumph to late father". Goal.com. 9 May 2012. Retrieved 11 June 2012. ↑ "Real Madrid 4–1 Atlético Madrid". BBC Sport. 24 May 2014. Retrieved 25 May 2014. ↑ "Koke y Juanfran prolongan sus contratos hasta 2019 y 2018" [Koke and Juanfran extend their contracts until 2019 and 2018] (in Spanish). Diario AS. 25 June 2014. Retrieved 25 June 2014. ↑ "Ten-man PSV hold off Atlético". UEFA.com. 24 February 2016. Retrieved 15 March 2016. ↑ "Atlético Madrid overcome PSV in lengthy shoot-out". UEFA.com. 15 March 2016. Retrieved 15 March 2016. ↑ "Atletico's Champions League defeat will cut deep as curse of 'El Pupas' strikes again". The Daily Telegraph. 28 May 2016. Retrieved 29 May 2016. ↑ "2004: Juanfran". UEFA.com. 1 April 2008. ↑ "Spain-Brazil". FIFA.com. 19 December 2003. ↑ "Argentina-Spain". FIFA.com. 25 June 2005. ↑ "Adrián está listo para la Eurocopa" [Adrián is ready for Euro] (in Spanish). Marca. 26 May 2012. Retrieved 26 May 2012. ↑ "De pasear la estrella a ver las estrellas" [From parading star to seeing stars] (in Spanish). Marca. 17 November 2013. Retrieved 17 November 2013. ↑ "La FIFA anula el Guinea-España" [FIFA annul Guinea-Spain] (in Spanish). Diario AS. 31 December 2013. Retrieved 25 June 2014. 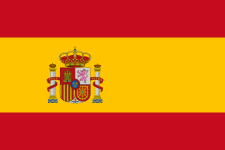 ↑ "World Cup 2014: Diego Costa and Fernando Torres in Spain squad". BBC Sport. 13 May 2014. Retrieved 13 May 2014. ↑ Naranjo, Alma (27 May 2016). "Las mujeres del Madrid ganan a las del Atlético en la final de la Champions" [Madrid's women defeat Atlético's in Champions final] (in Spanish). El Español. Retrieved 17 November 2016. ↑ "Griezmann, Juanfran, Siqueira...: Pluie de bébés à l'Atletico Madrid!" [Griezmann, Juanfran, Siquiera...: It's raining babies at Atlético Madrid!] (in French). Pure People. 3 November 2015. Retrieved 15 March 2016. ↑ "Juanfran". Soccerway. Retrieved 28 May 2016. ↑ "Juanfran". European Football. Retrieved 24 June 2014. Wikimedia Commons has media related to Juanfran Torres.